By Kori ~ April 30th, 2012. DenHoed Wine Estates, founded in 2006, is a joint venture between grape growing brothers Bill and Andy Den Hoed and Washington wine pioneer Allen Shoup. DenHoed produces two red wines, both made exclusively with fruit from Wallula Vineyard in the Horse Heaven Hills. Wallula Vineyard is located high above the Columbia River south of Kennewick, Washington. The vineyard site terraces down 1300 feet on the southeastern corner of the Columbia River, where the river becomes the border between Washington and Oregon. The Den Hoed brothers established DenHoed Wine Estates in honor of their parents, Dutch immigrants who began planting grapes in the Columbia Valley in the 1950â€™s. 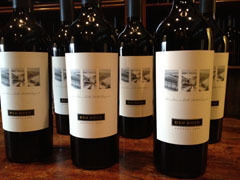 Marieâ€™s View, named for their mother, is a red blend made by winemaker Rob Newsom of Boudreaux Cellars. Andreas, named for their father, is a Cabernet Sauvignon made by winemaker Gilles Nicault of Long Shadows. 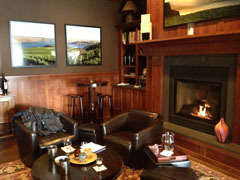 The Library in Woodinville is a unique tasting room that features the wines of DenHoed Wine Estates, Long Shadows, and Boudreaux Cellars. It is a cozy setting with comfortable leather chairs and a fireplace where guests can taste through a flight of wines featuring all three wineries. Recently, we had the pleasure to visit The Library to taste through DenHoedâ€™s complete lineup of released wines, three vintages of Marieâ€™s View and three vintages of Andreas. All six wines were very good but we were especially impressed with the 2006 and 2007 Marieâ€™s View. They are both outstanding. 2005 Den Hoed Marieâ€™s View (Wallula Vineyard, Horse Heaven Hills, Washington): 24% Cabernet Sauvignon, 16% Merlot, 36% Syrah, 12% Cabernet Franc, and 12% Sangiovese. Dark, dense red.Â Nice nose with aromas of dark red fruit, chocolate, coffee, and cinnamon. Black and red cherry, chocolate, and spice come through on the palate. Medium to full-bodied with lively acidity, and medium to high, smooth tannins. Well-balanced with a long, lingering finish. 2006 Den Hoed Marieâ€™s View (Wallula Vineyard, Horse Heaven Hills, Washington): 33% Cabernet Sauvignon, 22% Merlot, 22% Syrah, 11% Petit Verdot, 6% Cabernet Franc, and 6% Sangiovese. Dark, dense red. Aromatic with black fruit, smoke, and oak on the nose. Blackberry, blackcurrant, smoked meat, and a touch of spice come through on the palate. Full-bodied with crisp acidity, and medium to high, drying tannins. Well-balanced with good complexity and a very long finish. 2007 Den Hoed Marieâ€™s View (Wallula Vineyard, Horse Heaven Hills, Washington): 33% Cabernet Sauvignon, 33% Syrah, 12% Merlot, 11% Petit Verdot, and 11% Cabernet Franc and Sangiovese co-fermented. Deep, dark purplish red. Gorgeous nose with black fruit, leather, and spice aromas. Black cherry, black plum, and clove come through on the palate. Full-bodied with lively acidity, and medium to high tannins. Well-balanced with a long, dry finish. Still very young but should age extremely well. 2006 Den Hoed Andreas (Wallula Vineyard, Horse Heaven Hills, Washington): 100% Cabernet Sauvignon. Deep, dark purple. Nose is a bit tight at first. Aromas and flavors of black cherry, chocolate, and oak. Medium to full-bodied with lively acidity, medium, dry tannins, and a long finish. 2007 Den Hoed Andreas (Wallula Vineyard, Horse Heaven Hills, Washington): 100% Cabernet Sauvignon. Deep, dark ruby red. Aromatic with black fruit, lavender, and floral notes on the nose. Lush black fruit, spice, and floral notes come through on the palate. Medium to full-bodied with crisp acidity, and medium to high, dry tannins. Well-balanced with a long finish. 2008 Den Hoed Andreas (Wallula Vineyard, Horse Heaven Hills, Washington): 100% Cabernet Sauvignon. Deep, dark purplish red. Nice nose with ripe red fruit aromas along with a touch of smoke and oak. Black cherry and oak come through on the palate. Medium-bodied with lively acidity, medium, soft tannins, and a long finish.